Lex Witness – India’s 1st Magazine on Legal & Corporate Affairs has been organising a plethora of knowledge driven summits ever since its inception in 2009. These summits have been focusing on industry sectors right from Real Estate to Pharmaceuticals. However, every financial year at Lex Witness closes with a trio of the country’s most elite gathering of in house counsel from across various industry sectors in India Inc. Yes, The Grand Masters 2018 Summit Series –A Corporate Counsel Legal Best Practices Summit Series. The series starts with its 2018 debut edition at New Delhi on the 8th February 2018 followed by the Mumbai edition on 16th February 2018 and the concluding edition on 23rd February 2018. After completing 5 successful annual editions in the past, we bring to all The Grand Masters 2018 Summit Series that brings together select in house counsel together to discuss all the major legal and regulatory undercurrents that their respective industry sectors would have gone through. The discussions not only include the industry’s best veterans as speakers but an audience which is as mighty as ever. 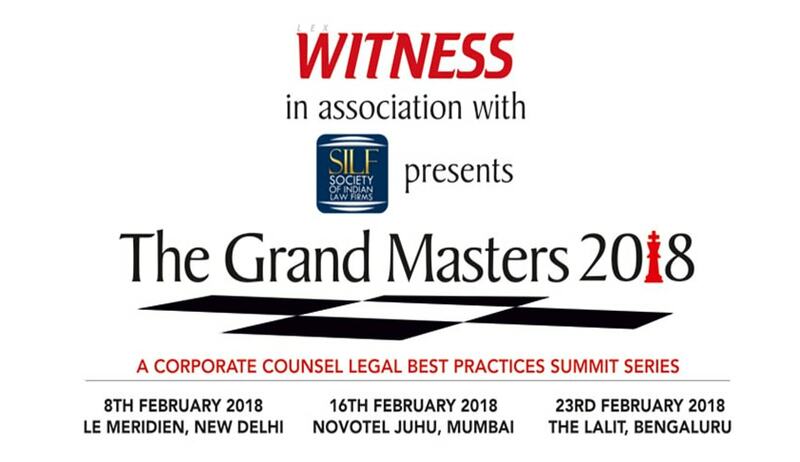 It is The Grand Masters 2018 Summit Series through which Lex Witness salute the spirits of the in-house counsel community for their contribution towards creating a very sound business environment in the country in terms of the law of the land. The All New General Counsel 2.0 – Ready for The Upgrade? Legal Tech Talks – Customary or Innovative Enough? The Regulatory Rage – Ready to Roar? India’s IPR Quotient – Beginning of A New Race? Chambers, Cabins & Courts – Would You Choose to Litigate or Arbitrate? And yes, this immensely powerful mix of discussion stands incomplete without the external counsel, advisory firms and the likes who leave no stone unturned in executing the best of the legal strategies right from the board room to the court room. Also the 2018 summit series will host a marathon of power packed discussions and deliberations to several legal and regulatory complexities in various dimensions.